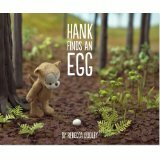 Summary: Hank, a small teddy bear, finds an egg on the ground in the forest. He picks it up carefully and searches for the nest from which it has fallen. The nest is far too high for Hank to reach but he perseveres. He rolls a tree stump under the nest. Too short. He builds a ladder with twigs. Too short. As day turns to night Hank takes the egg to his “den,” builds a fire to keep the egg warm, and sleeps with the egg under a blanket of leaves. The next morning, he sets out to try again. This time the mother hummingbird is on hand. Hank places the egg in a small nest of moss and ties slender stalks of grass around it to make a package which the mother can pick up in her bill. The egg is returned safely to its nest and Hank sits back against a tree to greet the birds when they hatch. The rescued bird has a special greeting for Hank. Literary elements at work in the story: Hank is a wordless picture book. Actually everything in the pictures-Hank, the leaves, the ferns, the trees, the birds- are made by Dudley, set in a diorama, and photographed. The details are worth “reading” carefully. You will go far before you find a protagonist as appealing as Hank. The page lay-outs are effective in giving action to a story told in photos. Three panels across the page with space in between depict Hank walking or moving a tree stump. The lighting as Hank lights the fire and cares for the egg makes a very tender picture. This will be a most satisfying lap book or a book an older sibling can “read” to a younger one. How does the perspective on gender/race/culture/economics/ability make a difference to the story? These perspectives are not present in Storywoods Forest. Theological Conversation Partners: This is a simple story of kindness and compassion and of the effort, perseverance, ingenuity, and cooperation required to be compassionate. It is, minus the overtones of prejudice, the Good Samaritan for the preschooler. Luke 10:29-37. Hank is the one who shows mercy. One of the tasks of Christian nurture is to fill abstract words like kindness and mercy, empty vessels for the young, with meaning. Hank is perfect “filler” material. Some understanding of eggs and how they hatch is needed to appreciate the story fully but kindness and care are depicted clearly without any other knowledge. Why did Hank pick up the egg? What did he do that shows he understood how fragile an egg is? Was it easy to replace the egg in the nest? What did Hank try? Do you think Hank was discouraged as he walked to his home with the egg that night? What would have happened to the egg if Hank had not picked it up? How did the “egg” thank Hank. Who needs your kindness? How can you be kind? This review was written by regular contributor Virginia Thomas. Hank Finds an Egg by Storypath is licensed under a Creative Commons Attribution-NonCommercial 4.0 International License.